If you love a good “Early Bird” discount (who doesn’t? ), we think you’ll really love our “Early, Early Bird” discount. With our San Francisco and New York events both scheduled for the fall this year, we decided to take things up a notch and offer the event industry’s first-ever “Early, Early Bird” discount! As the name implies, our Early, Early Bird discount doubles our normal 10% Early Bird discount to 20% for all three of our awesome exhibitor packages. As always, all our discount programs are cumulative, so companies that sign up for both events this month, receive an additional 5% multiple event discount for a total savings of 25%. Our unique two-day format features two separate press events PLUS a three-hour showcase for the influential, hard-to-reach tech geeks brands need on their side today. Amazingly, all our exhibitor packages are less expensive than typical tech industry media events even before any discounts and we offer a lot more, including the event industry’s only money back guarantee. Don’t wait too long. Our Early, Early Bird discounts ends two weeks from today. To sign up, just select your exhibitor package and fill out our 2018 contract. We even give you up to 30 days prior to the event to cancel if you change your mind! Reduced Pricing AND a Bonus Case! Offer Expires on Friday, December 1, 2017 @ 2:59 AM EST. We are thrilled to be able to offer members of the getgeeked community a VERY SPECIAL DEAL on a truly innovative new multi-functional modular phone case system made by Case By Case, an exciting startup based in San Diego. We know what you’re thinking. How innovative can a phone case be? Well, for starters this one is a 2018 CES Innovation Award Honoree. The unique base on the Case By Case can be attached to a variety of additional pieces that fall under one of three categories – protection, accessories, and mounts to allow you to use the case in almost every imaginable scenario. Snap on a mount to hook it to your bicycle, stroller, etc. Snap on a folio wallet to carry your cash and credit cards. 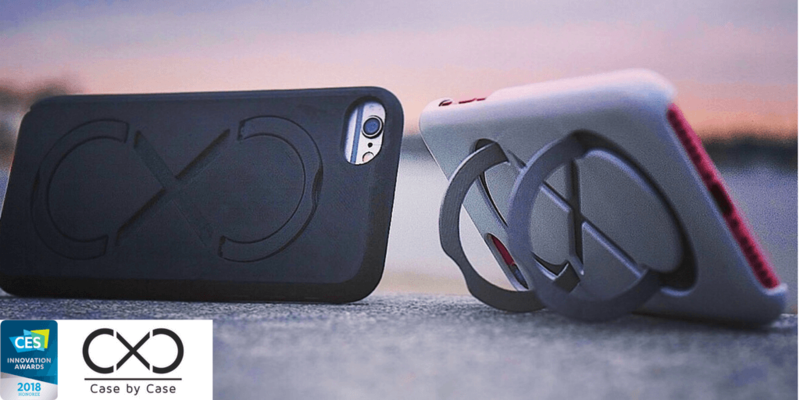 Snap on a buoyant bumper to take your phone swimming. Snap on a GoPro mount to capture cool video. Snap on a portable battery to charge your phone. Snap on a… well, you get the idea. You can see a few of the nine available attachments in action below. It’s pretty amazing. 1. 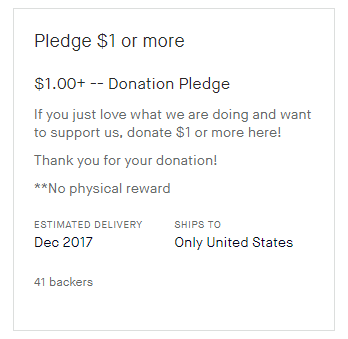 Go to the Case By Case Kickstarter page, hover over the box on the right at the top that says “Pledge $1 or more” and select it. 2. After you select the $1 Pledge, a field will come up asking you to enter in your pledge amount. Don’t enter $1. Instead, enter in one of the following amounts from the first column in the chart below to get the deal indicated in that row. In addition to the special pricing below, you will also receive ONE ADDITIONAL CASE BY CASE you can use as a gift this holiday season! *All pricing above includes shipping costs. *You will be able to choose your case preference and attachments once the Kickstarter campaign officially ends. *Cases are scheduled to be delivered in December 2017. For more information on Case By Case, check out their Kickstarter page. If you have any questions, comments or concerns about the information in this post, shoot us an email at casebycase@getgeeked.tv. Black Friday is a big day for deal-hunters of any kind, but for geeks, it’s especially so! Sure, the ritual of waking up at the crack of dawn and heading out Best Buy to make sure you snare that new TV for 50% off is less important these days with Black Friday morphing into Black November and Cyber Monday lurking just around the corner. But, regardless, there are bargains to be had and some of the best ones are easily missed because while you’re reading about the deals offered through Amazon, you may be missing the deals being offered directly by the companies themselves. That’s where we come in, of course! Below are links to great deals being offered to you directly by brands that you may not see featured in tech blogs or store flyers. From stocking stuffers to crazy-cool and unique gifts for the geek on your list, the list below includes sales on 3D printers, wearables (and hearables), robotics and toys that teach kids to code, smart home gear, headphones and speakers, high-tech camping gear, cutting-edge accessories, eScooters and lots more. Best of all, most of the deals offered below last at least through Cyber Monday if not beyond. 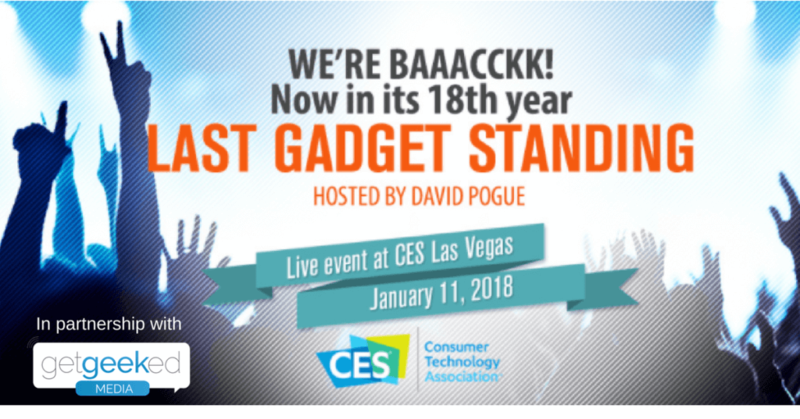 We are excited to announce that getgeeked Media is an official partner of the Last Gadget Standing competition at the 2018 International CES held in Las Vegas in January. This, my friends, is a big deal! CES is, of course. the BIGGEST tech industry gathering of the year and we’re thrilled to have an official role for the first time. Now in its 18th year, Last Gadget Standing is both the longest-running and most beloved of all the competitions held at CES. Each year it is a showcase of the most innovative products on display at CES. Dozens of companies compete in the month-long competition leading up to CES to see which 10 finalists will compete live onstage for the honor to be called The Last Gadget Standing. All participants receive tremendous exposure on the competition’s homepage, dedicated competitor pages, and across social media. Hosted by the one and only David Pogue and produced by Living in Digital Times, the finals at CES play to a room jam-packed with tech industry luminaries and top journalists every year. As part of our partnership, getgeeked Media Founder Barry Myers joins an esteemed group of judges responsible for selecting the finalists. Click here to see videos of the finalists’ presentations at the last CES. If your company is interested in participating, shoot us an email at lastgadgetstanding@getgeeked.tv. Complimentary Last Gadget Standing Entry for Companies that Sign Up for getgeeked San Francisco. Starting today, any company that signs up for getgeeked San Francisco can enter one product in the Last Gadget Standing Competition at CES for FREE! That’s a $500 value. Hope to see you in San Francisco and Vegas! We took a little risk at our San Francisco event last fall by splitting the event into separate nights for the press and the geeks, but the results were amazing. Each of our audiences loved having their own night, but, more importantly, our exhibitors told us that it really helped them communicate more effectively with each group. As we approach our 2017 San Francisco event, we’re working on ways to deliver even more value to the companies that participate. 1. MORE PRESS – We get it. Press coverage is still our exhibitors’ top priority. We also know that some press prefer to attend events during the work day so the natural next step now that we have a two-night event is to maximize the press attendance by giving them that option. getgeeked SF will be open to the press on the first night as always and then again for a luncheon on the second afternoon, giving exhibitors two opportunities to meet with them. You can see how the schedule breaks down here. We’re also creating dedicated outreach initiatives to identify and invite the area’s most prominent lifestyle bloggers and YouTubers. 2. MORE OPTIONS – We were one of the first (if not the first) events to separate exhibit space from marketing packages to give companies more flexibility to create packages that met their specific objective and budget. Beginning with getgeeked SF, our exhibitor packages are now completely a la carte. Just fill out our Exhibitor Selection Form and tell us what you want. From special events to content to unique branding opportunities, post-event reports and attendee communications, there are a ton of terrific options, but even if you just take space, you’ll still get the basic print and online branding and still be able to participate in getgeeked Shopping Zone and social media contests. 3. MORE SAVINGS – Our events already cost less than a single three-hour press-only event like Pepcom and, of course, we offer a lot more. Now, we’re offering even more ways to save with early bird programs, two tiers of start-up discounts, multiple event discounts, and single-night only discounts. We even give you a discount if you create a custom package valued at over $5,000! 4. MORE SALES – Our attendees have told us they would be more likely to make purchases from the getgeeked Shopping Zone once the show was over so for the first time ever, the getgeeked Shopping Zone will be promoted beyond the event to all our members and will remain open for one week following the event. All getgeeked members will be reminded via email after the event about the great deals exhibitors are offering in the Shopping Zone. 5. MORE GEEKS – Through partnerships with great local tech organizations like Tech in Motion and SF NewTech, we’re doing more to ensure the geeks you meet with on the second night are the right ones. 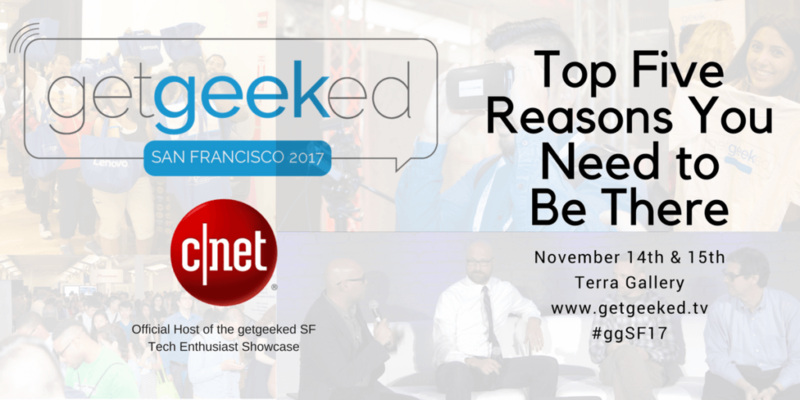 We’re thrilled to announce that CNET will return this year as The Official Host of the getgeeked SF Enthusiast Showcase on the second night of the event. The CNET Lounge is sure to be jumping again and, as they did last year, CNET will have some of its top correspondents roaming the show floor and live streaming all the action to their 2 million Facebook fans. There are just five (plus one) of the reasons we think getgeeked SF will be our best event ever, but we’re working on several other exciting ideas and partnerships designed to raise the profile of our events and make sure the impact of exhibiting reaches further and lasts longer. Now that’s something to get geeked about!